Lease or Purchase decision involves applying capital budgeting principles to determine if leasing as an asset is a better option than buying it. Leasing is a contract between the owner (lesser) and the lessee for the hiring of a specific asset. Leasing can apply to any fixed assets and quite commonly used for plant and machinery, office equipment and motors vehicles. Buying the asset involves the purchase of the asset with the company’s own funds or arranging a loan to finance the purchase. 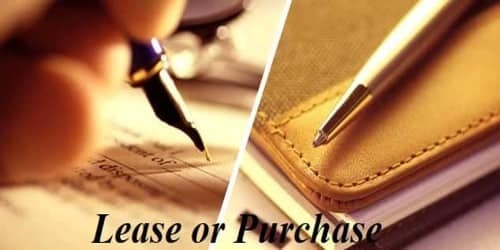 Instead of acquiring these assets for itself, the company enters into an agreement with a leasing company whereby the latter purchase the assets in question and then lease them ( rent or hire them) on a long-term basis to the former. In return for most-but not all of the benefits of ownership, the user (lessee) makes periodic payments to the owner of the asset (lessor). No initial funds are required but there is instead a regular charge for lease payments to be charged in the profit and loss account. The lease payment covers the original cost of the equipment or other asset and provides the lessor a profit. The lessee obtains possession and use of the asset in exchange for the rentals, while the lessor retains legal ownership. The operating lease, or “maintenance lease,” can usually be canceled under conditions spelled out in the lease agreement. Operating lease is one where an asset leased or hired for a period of time substantially less than that of its useful life. A finance lease is one which lasts for the whole of an asset’s useful life and where the lessee effectively takes all the risks and benefits associated with ownership. A financial lease is usually written for a term not to exceed the economic life of the equipment. Leasing an asset from the lessor or purchase of an asset by borrowing the full purchase price of an asset should be compared as financing alternatives that are dependent on the investment decision. As the use of leasing has increased as a method for businesses to acquire the use of equipment and other assets, the number of companies in the leasing business has increased dramatically. As such, such investment has been evaluated as part of a company’s capital budgeting process and mostly use the NPV method by analysis using the after-tax cost of debt as the discount rate for decision making. Lease rental payments are similar to the payments of interest on debt so leasing may be a good alternative to borrowing for the firm. Commercial banks, insurance companies, and finance companies do most of the leasing. Many of these organizations have formed subsidiaries primarily concerned with equipment leasing.